As our troops continue to stream home to us, families are having to deal with a variety of adjustment issues. Soldiers, sailors, airmen, and Marines are likely coping with combat stress or post-traumatic stress disorder; and so, Navy hospitals have been reaching out to help their service members and families via traditional counseling and online videos to assist families in understanding some of the reintegration issues they'll be facing. [UPDATE Apr 09 2007]: View videos below. Sgt. Milton Caples made it home to his wife and daughter after a year as a security convoy driver in Iraq, but thoughts of suicide bombers and mortar attacks haunted him, nearly costing him his former life. Driving on the rural roads near his home, he would flashback to the streets of Balad and Tikrit, speed up and try to out run other drivers. "I would know I was doing crazy stuff. It would seem like I was driving but I wasn't there. I was looking at myself doing stuff in a video game or something," he said. "In some cases, I'm glad the police didn't see me because they would have taken my license away." He spent his nights doing security patrols of the family home - repeatedly checking to see if doors and windows were locked, if anyone was prowling around outside. His anger ate away his relationship with his wife and daughter, who struggled to reach the fun-loving man they once knew. Three years into the Iraq war and almost five years after the invasion of Afghanistan, American families like the Capleses are increasingly becoming part of its collateral damage. Learning from the mistakes of Vietnam, the military has long encouraged returning soldiers to seek counseling. Now its leaders are trying something different - reaching out to the soldiers' families. Although treatment and medication have evolved since Vietnam, the warrior mentality still prevents most returning soldiers from getting the help they need, said Rick Weidman of Vietnam Veterans of America. "Real men don't eat quiche and they don't have problems like this - hooah," he said, giving the shout soldiers make. To counteract this attitude, Navy hospitals have begun advertising their counseling programs as well as pointing families to their online PTSD video series. The videos were designed not for service members, but their families. "The goal was to bring in the family in hopes that if the individual wouldn't come in on their own, we would reach them through the family. We made thousands of copies and distributed them to all kinds of places," said retired Navy Capt. Jennifer Morse, the San Diego Naval Hospital psychiatrist featured on the videos. The Navy began producing the videos in 2004 and is releasing a re-edited version of the project in the coming months. "The intent is to get people help, not to fix them over the Internet. (To tell them that) they shouldn't be ashamed of their feelings after they have served in these situations," said Bill Hendrix the Navy's Pentagon-based coordinator of the Lifelines video project. The videos have been so successful that the Air Force and the Army are also using them to encourage families to seek counseling for veterans of both Iraq and Afghanistan, Hendrix said. Weidman, of the Washington-based Vietnam veterans group, applauded the efforts to reach troops by reaching out to families. "The military, under significant pressure, has made some significant efforts," he said. Vietnam Veterans of America has long pushed the Department of Defense to develop such programs, he said. But Capt. Jeffrey Weyeneth, a psychiatrist at Pensacola Naval Hospital, estimates continued counseling programs still reach only 10 percent of troops returning from Iraq and Afghanistan. "A lot of guys, they see it as a nick in their armor, 'If I want to do 20 (years) or more, I don't want to be seen as a nut case'. And confidentiality is difficult with the military because mental health can affect your ability to function in the military so confidentiality is not as absolute as it is in the civilian world," he said. Returning soldiers who go without treatment often hide their stress from co-workers to avoid ruining their careers and instead take their problems out on their families, Weyeneth said. "A lot of these guys come back from war but never get out of the combat, the enemy just changes. They direct their anger at other people," he said. You may access the full Lifelines video series online. Want to stay connected? 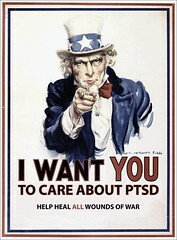 You can subscribe to PTSD Combat via Feedburner or follow Ilona on Twitter.